What constitutes The Perfect Days? Well, we’re suffering neither a drought nor a flood; it rains only occasionally, which is just about perfect. Afternoons are nice and warm (in the mid-20s Celsius, or the mid-70s American) while mornings are cool. Humidity is low. And the tourists are now thinning out, with local campgrounds showing more ground than tents and campers. 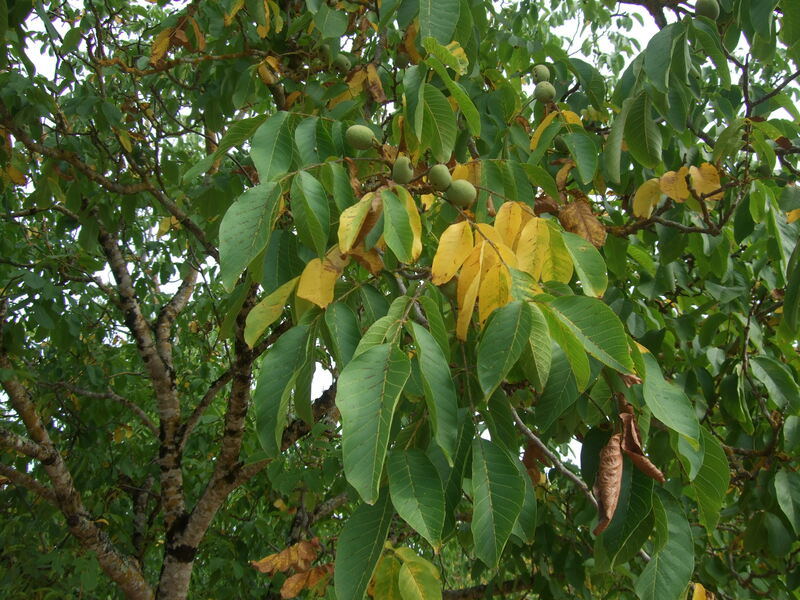 Of course the touch of coolness in the late nights and early mornings acts as a signal for trees and plants to start getting ready for the colder weather to come, and one of the earliest trees to react are the walnuts. 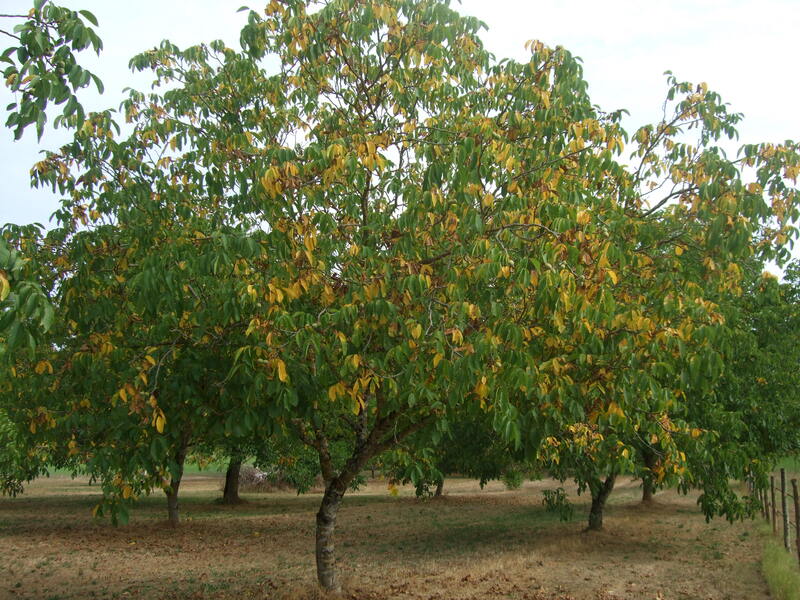 Walnut groves are sprinkled throughout the GDA. 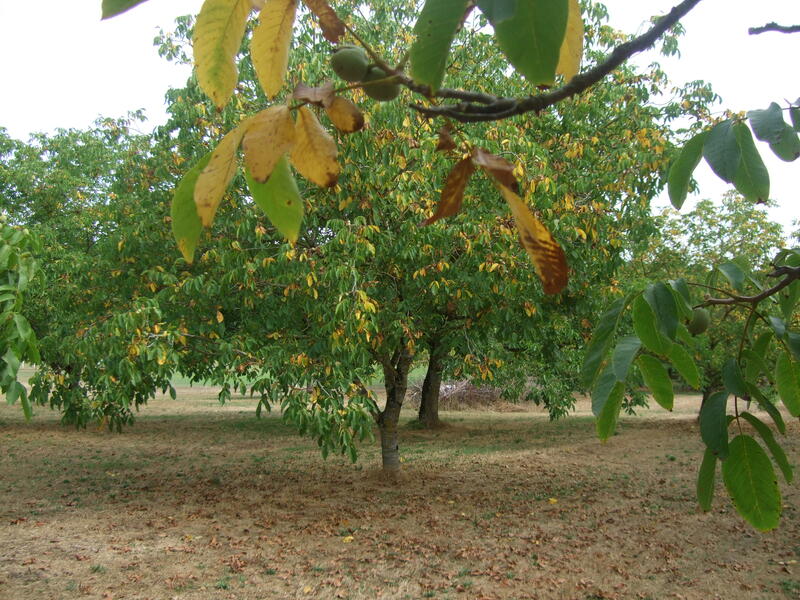 This morning, I went for a pleasant ride on my hybrid bike and took a few photos of some walnut trees that are starting to show glimmers of gold — their leaves turning yellow as the walnuts themselves ripen and start to fall to the ground. You can just see the green walnuts, starting to ripen. A walnut tree that’s speckled with golden leaves. Another look as this walnut grove starts to turn golden. To my mind, this is perhaps the best time of year for a vacation in the GDA — the weather is pleasant and everything is less crowded, but the restaurants and shops are still on tourist-season hours. Of course families with children need to vacation in June, July or August, when schools are closed. But if you can manage a vacation in late August and September, you’d be most happy with The Perfect Days here. This entry was posted in Flora and fauna, Life in southwest France, Weather in the Dordogne and tagged autumn in Daglan, bicycling, cycling, Daglan, Dordogne weather, flowering trees, nature, plants, walnut trees, walnuts, weather. Bookmark the permalink. Speaking on behalf of the entire team here, we appreciate your kind words as well as your kind offer, and would be delighted to join RFB for dinner. See you soon. Hoping to get to the GDA next year in September for those perfect days!! Always need something to look forward to!! That would be lovely, Joan!